A recent trip to London - two good eyes again! Sometimes, listening to the television news or radio presenters, one might think that London was the centre of the known universe, the way everything seems to be centred there. You know what I mean, if it’s sunny in London, it’s sunny everywhere in the UK which, of course, is patently not true. Yet, it cannot be denied that there is a certain magic, a magnetic pull, if you like, to what must be one of the greatest cities in the world. I’d forgotten that feeling, not having been for a few years, but I certainly felt it when my dear husband and I spent a long weekend there very recently. As one does, we crammed in as much as possible. On the Friday afternoon, we visited the Museum of London, which traces the history of the city back to prehistoric times and has some terrific exhibits. From there, a short walk brought us to the breath-taking St Paul’s Cathedral, which, amazingly I’d never seen before. Sadly, we didn’t have time for more than a short walk around as the building was approaching closing time. We did manage to see the magnificent tombs of the Duke of Wellington and Horatio Nelson though. In the evening, we went on a ‘See London by Night’ bus tour from Green Park. This was excellent value for money and took in both the Cities of London and Westminster. Even though both of us had been to London many times before, we still learned much from the commentary. Incidentally, we were the only British people on the bus, all the rest were tourists! On the Saturday, we over-indulged on the theatre, a passion of mine. For the matinee, we saw ‘The War Horse’ at the New London Theatre in Drury Lane. What a magnificent show that is! Even though I’m a writer, I cannot find enough words to describe the phenomenon of the production’s puppeteering. You know that people are manipulating the puppet because you can see the hands and legs but it is done so cleverly that somehow you manage to ignore it. The evening show was the new production of ‘Miss Saigon.’ We had seen the original production but wanted to see the new one, although this was only a preview. The show doesn’t officially start until 22nd May. I love the music from the show, especially ‘The Last Night of the World.’ The ending of this production differs slightly from the original production but this has, I think, improved it dramatically. Well done! I wish it a prolonged run. By the time Sunday came, I was well and truly knackered with all the walking about. It’s not just the streets but the escalators and the long corridors of the Underground that are all tiring. Bearing this in mind, we opted to take the river cruise from Hampton Court Palace. When we got to Westminster Pier, it was to find it crowded with Crystal Palace supporters. Although they were all goodnatured, they were very vociferous and couldn’t imagine being in their company for too long. When we tried to get on the boat, we discovered that it was a football special and we needed another boat. Phew! Our boat was the quaint Princess Freda dating from 1926 and much more relaxing. The cruise took three-and-a-half hours but was excellent value for money and very relaxing. I even dozed off on hubby’s shoulder for a short while! I had long wanted to see Hampton Court Palace but, although the exterior lived up to expectations, I was disappointed by the interior. It seemed ‘bitty’ and the rooms were only barely furnished. The distance between Henry VIII’s apartments was so vast that I couldn’t help feeling sorry for the kitchen hands of 500 years ago having to dash between the kitchen and the Great Hall. The food must always have been cold. We travelled back to Central London by train in company with dozens of bikes and their owners, who’d all been on a charity bike ride in aid of the Stroke Association. Monday morning consisted of a dash back to Chesterfield on an early train because I was booked in for my second cataract operation in the afternoon. I’m glad to report that this was carried out successfully and I now have two eyes that work in conjunction with each other. I’m even managing to read a little with the help of some cheap reading glasses though I’m careful not to do it for two long so that I don’t strain my eyes. I drove myself to church on Sunday, too, something I haven’t done since last December. All in all, a good weekend to look back on, with a satisfactory conclusion. Birmingham was a time I became more aware of relatives. With moving away from the Bolton areas where most of our relations lived, I’d missed out on much of the extended family where everyone got together for birthdays, Christmas, New Year, weddings and funerals, keeping up with each other’s doings. In those days, families tended to live close together, often in the same street, with aunts, uncles and cousins maybe in the next street. There was the disadvantage, of course, of not being able to do anything without the family knowing. This lack of extended family was exacerbated by my having no grandparents or siblings (at least then.). Both grandfathers were killed within a month of each other during the Gallipoli Campaign. My maternal grandmother died in 1924; my paternal grandmother died in 1936, just before my parents met. I’ve always been saddened by the fact that I never knew my grandparents. The rare visits of certain of our relatives are captured forever on film, tiny black and white pictures, now too fragile to scan. Our most frequent visitors were Auntie Mary, Uncle Syl and their family. Auntie Mary was Mum’s oldest sister by some five years and although they looked alike, particularly as both got older, that was the only resemblance. Mum was the live wire, the go-getter of the family while Auntie Mary was the home-maker, who’d married young and settled in the same place all her life with her family. She and Mum were very close. Certainly throughout my growing-up years, she was the one relation we saw the most of. Then there was my cousin George, her son, a couple of years older than me, who terrorised my life with his teasing. He had a broad, flattened thumb, deformed as a result of an argument with a clothes mangle when he was little and he delighted in pushing it under my nose. 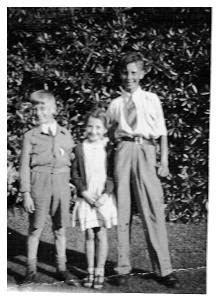 Although there are no photographs to record it, one incident with cousin Sylvia, George’s older sister, sticks sharply in my mind. She came to Birmingham when she must have been in her late teens. Her visit coincided, as it may well have been designed to, with a large garden party which Mr Barclay was holding to celebrate the purchase of the new garden. It was such a large event with so many guests that Mum and Dad couldn’t cope on their own and extra staff had been hired to help. One of them, an old soldier by the look of him, with bleary eyes and a bulbous nose, had been hired to organise the parking of the cars. Unfortunately, one of the hired waiters kept giving him glasses of the beer provided for the staff. The poor man became so drunk that every time he endeavoured to carry out his less than arduous duties, he fell over. He did this so many times that his nose was raw and bleeding from its contact with the drive and bits of gravel were embedded into it. In the end, he had be packed off home and someone else had to take over his duties. My cousin Sylvia was young, petite and pretty with startling blue Irish eyes, blonde hair and a flirtatious laugh (which she retained all her life). It was no wonder that she attracted the attention of one of the younger waiters. He plied Sylvia, who was helping out with the washing-up, with the remains of the champagne provided for the guests, liberally helping himself too. Some innate caution must have stopped Sylvia from having too much, though she was still tiddly but Roy, the waiter, was hopelessly and helplessly drunk. Eventually, he disappeared but everyone, including Sylvia, was too busy to bother about him just then. Even I helped, collecting glasses and taking them to where others were washing up. As the party was finishing and the clearing-up beginning, one of the older waiters came to the kitchen. ‘Ron, I’ve found Roy but I think you’d better come and take a look,’ he said. Being small, no one took any notice of me as I tagged on behind Mum, Dad, Sylvia and the older waiter. The sight greeting our eyes was not pleasant, nor easily forgotten. Roy had visited the toilet and obviously become ill while sitting there. Somehow, he had smeared his own faeces over the walls, the floor and the bowl itself. He was slouched, having passed out, against the wall and the floor. Somehow he’d managed to get his trousers up but they too were badly soiled as were his hands. Mum, gagging at the sight and the smell, turned away. ‘I don’t care how you do it but get that lot cleaned up,’ she muttered. ‘I’m not going to do it and neither is Ron.’ Catching sight of me for the first time, she grabbed hold of my hand and dragged me away. I’ve been wary of the power of champagne since then. You’d think I’d have learned from that incident but I didn’t; I was once very ill after getting drunk on cheap Spanish champagne cocktails. Mum’s other sister, Annie, came to visit us in Birmingham, too, with her husband, Eddy Robinson and their son, Richard, a good few years older than me. Aunty Annie had missed out on the Morris good looks for she was tall and ungainly, with soft frizzy permed hair and red cheeks. She and Mum were more alike in temperament and sometimes had rows when they wouldn’t speak for ages. With typical childish intolerance, I never took much notice of Uncle Eddy. He was tall, with a bristly moustache, always with a pipe close at hand. He was also deaf, which made communication difficult. My cousin Richard was too grown up to be bothered with little Anne. He seemed very superior. He wasn’t, of course, he had a bit of a stutter and this made him shy. We also had a couple of visits from Dad’s brother, my Uncle Mark and his family. They always seemed to have the kind of lifestyle that spoke of riches to us, especially as they owned their own house in Sale, Cheshire. Auntie Lenora, his wife, always seemed posh, a bit condescending in her manner. I was a bit afraid of her sharp tongue although I later learned to appreciate that her scolding often covered up a deep concern. They had two daughters, Patricia and Pamela, both younger than me. For some reason, both sets of parents thought Patricia and I should be friends, being closer in age. It never worked then and we’re not in touch any more to find out if it ever would. Relations were about to become more important for we were on the move again. Although we always seemed, in the nostalgic recesses of my mind, to eat well, severe rationing was still in force. Mr Barclay was in the habit of ringing up at the last minute, having invited someone round to dinner. ‘There’ll be four of us for grub tonight, Millie,’ he’d say and she’d be left to find something substantial for dinner out of what was often lean pickings. Occasionally, there were pheasants or grouse from a shoot or chickens and eggs from a farmer friend but more often than not, Mr Barclay and his friends would end up with our rations while we ‘made do’. In the end, the strain and constant worry began to tell on Mum and they decided to leave, much to Mr Barclay’s regret. In 1949, we were to move back to Bolton, Lancashire, where Dad had been brought up.